The Really Wild Veg project growing trials have been looking at how plants have been changed by domestication by growing crop wild relatives alongside domesticated equivalents. Comparing the nutritional qualities of these plants is something that has been carried out by the Rowett Institute of Nutrition and Health to explore whether the concentration of chemicals linked to maintaining health in humans show any significant variation between wild and domesticated plants. One of the confounding variables in such work is the influence of the environment on the growth of plants, which in turn can alter their chemical profiles. Data generated in 2014 will benefit from detailed soil analysis carried out by the James Hutton Institute that will hopefully shed light on the role that variations in soil can have on the chemicals that plants produce. Richard ready to sample soils at the Fife location of the wild cabbage used for the Really Wild Veg growing trials. Having sampled all of the trial plots it made sense to sample from sites where seeds of crop wild relatives had been collected. 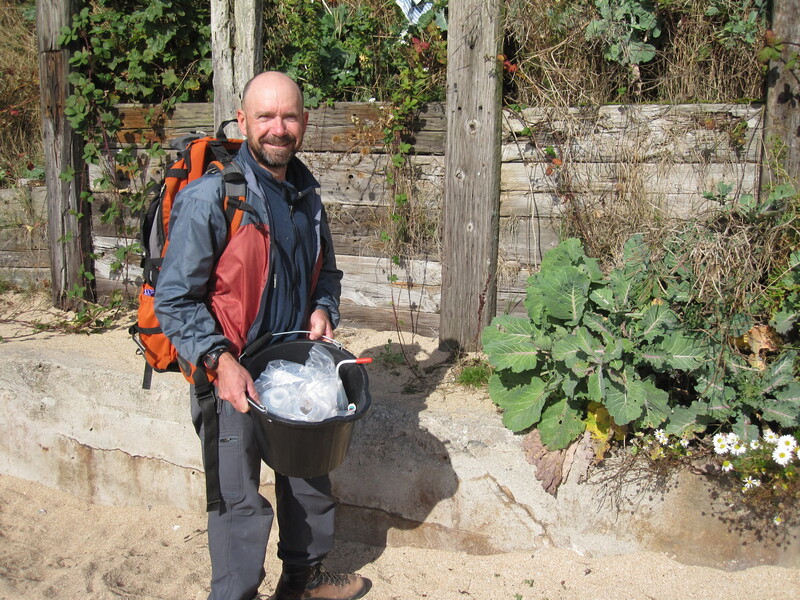 On a sunny 2nd of October Richard, from the James Hutton Institute, met me at the Fife location where wild cabbage was collected so that the necessary samples could be taken. The process involves multiple samples so a range of soil properties can be measured, including both major and minor plant nutrients, soil structure and the microbial life within the soil via analysis of DNA. A bonus of this work is that the participating gardens – Hermitage Vegetable Garden, Redhall Walled Garden and Cruickshank Botanic Garden – will all get a detailed picture of the soils they are working with that will help them make the most of what they grow and highlight any issues that they might need to address to improve their soil.